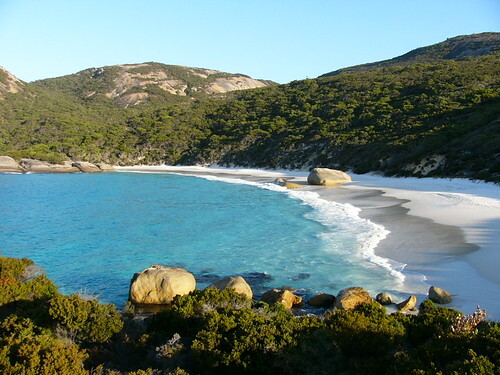 has been named one of Australia's top-five secret travel spots in a national survey." There is refreshments on the table, please help yourself, and there are nibblies if you're hungry; cheese, nuts, paté, dips, biscuits, and my speciality, piroshkis, they are yum. Turn up the music guys, the dancing has begun. Hey, I've lost my name at the top. Can I please have a G&T to go with the nibblies. Choc Mud Cake with the cuppa this morning, you're an excellent hostess. Thanks Anne for your hospitality. just came past again to say hello seeing our fun today and our tea party here have been wiped away to cyber space. Thanks for calling in Rosemary. It sure was a fun day, today. I even cracked up in the supermarket talking to a young chap. I see that lot more comments went to the Twilight Zone since I was last on this morning. So what did I miss. Rola - you missed a lot of laughs. I don't think I stopped laughing all day. Even in the supermarket. what are we dancing to!!! hey Anne what a great and goodly list of goodies! and such a nice page with your own title! I am here, me, not the other person who I couldn't remember today, different me altogether, how nice it is to have two personalities... this one not at all forgetful of course. can i try a piroshki? what are they?? anne how did you do it, the prettying up part? Hello Anne, wow its the happening place here, said while belly dancing to the tune of 'Play That Funky Music! not a good look but I am trying! Hiya André, glad to hear that you're having fun at my party. Way to go, girl. Have something else to eat, Mickey. You can balance it in one hand while your drink it in the other. Good day to you Anne! Nice play you have here. Full of sunshine, music and laughter! I'll drop in again sometime! Hello Greg, thank you for visiting me and joining in the fun. Girls, girls, get back, you'd think that you've never seen a man before. Although I must admit, Greg's the first male to visit any of us. Thanks Greg. I too have been chuckling a lot since I checked in this afternoon while in the phone queue. Home from work now, so can I have a nice hot chocolate please and then I'll wander off to bed cos I'm back at work very early tomorrow. what an awesome place you have here! Still managed to grab a few nibbles left. I too dropped in a few times today and cracked up. The last conversation was about Il Divo. It sent me scurrying off to find out where and when so I could get some tickets. It is right before my birthday in Feb so have laid some VERY heavy hints to hubby now. Hi girls, Topaz, they're not coming to Perth so I'm not very impressed with that. I did buy their latest CD today which was only released yesterday. One hot chocolate coming up CP, how do you like it? Anne, I'm back! Three times is a charm. My, you are the perfect hostess. The music is just right, and the refreshments are satisfying. Thank you! I will relax and enjoy often. What a lovely spread you've got laid out! It's only 6am over here, so I will just have a little nibble--not quite awake enough for dancing! Thanks for visiting my housewarming party, everyone, except the uninvited pest. It was lovely having you all drop in. ignore bugs easy to get rid of them and bugs are bugs whatever you do..
well i enjoyed your cakes and the place is too cozy to leave..(see the bugs too dont budge)thats why you shudnt make it too attractive!! Well done, baby ladybug. Thank your Mum for visiting me. Tell her I won't make her any piroshkis again, she'll have to make her own. Good night everyone. Thanks for sharing my party with my. You sure know how to make a person feel welcome! Anne, it looks like you throw a wonderful party. I'll bring some photos, buttered on both sides, one sweet and the other savoury. Which reminds me that I have a photo somewhere of one of my wife's luscious looking home made pizzas, I must dig it up and post it - the photo that is, not the pizza. Heck Anne. I come back for a visit after work and you're in bed. At least you could have left the door open and saved me a piroshki. Now I have to eat a peanut butter and jam sandwich. Hi Anne, You have a warm and welcoming place here and your refreshments were really yummy! Thanks. What a way to go. Only thing missing is the photos of all. Maybe it could be an entry fee that visitors have to post a photo on entry??????? The ladybug that visited me last night was in fact my daughter paying me a visit. The reference to cheese was probably because she knows I like the smelly ones like blue vein, and she loves piroshkis, she even makes them herself. So thanks, Rebecca, for visiting me in my place. Don't leave it so long before you visit again. Oh Anne, what a wonderfully warm welcome. Thank you. I love your place, it feels so welcoming. I shall return again. Plece feel free to pop by my place so that I can return your kindnesses.